Until you started shopping for a new sink, the central bit of plumbing probably seemed like a straightforward, one-size-fits-all item. However, from the shape of the basin to the number of bowls, contemporary kitchen sinks come in a surprising array of styles and configurations. Among the many variables, you can orient your kitchen drain either directly below the tap or off-set to one side. Off-set, or off-center, drains are used to help water drain even when a large pot is sitting in the sink. Nonetheless, the off-set design also has its drawbacks. The primary disadvantage of an off-center drain is that the water may drain slightly more slowly than in a standard sink with a centered drain. Instead of traveling from one side of the sink to the central drain, water gushes directly from the tap down the drain. If you have a flat-bottomed sink or a sink with a textured floor, the drainage lag can be even longer with an off-center drain. When supplying water for an in-sink garbage disposal, for example, it's necessary to run the water for a few seconds before you can turn on the disposal. If you prefer an off-center drain, despite the slower drainage speed, keep in mind that installation and repairs may also be slightly more challenging. 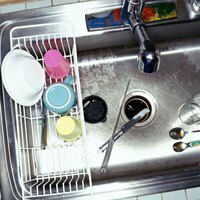 Usually, an off-center drain is positioned toward the back of the sink and to one side. When viewed from underneath, the drain tubing is typically much more crowded into one corner of the under-sink cabinet. As a result, any repair or installation work must be done in cramped quarters. If putting the drain deep in the corner of your sink means that you have to call in a professional instead of doing the work yourself, you may prefer to dedicate the potential savings to other premium sink features, such as higher-grade materials or more attractive hardware. As already indicated, the design of an off-center drain provides extra room below the sink for storage. However, if you use an off-set drain to capitalize on under-sink storage room, you may not have room left for a garbage disposal. Before opting for an off-set drain, weigh the relative benefits of various under-sink features such as a disposal, shelving for household products or elbow-room for future repair work. Besides the drain placement, choosing a kitchen can involve many other considerations, which you may find even more important than an off-set or central drain. For example, sink materials range from stainless steel to porcelain-coated cast iron to solid granite. If you fall in love with a granite slab sink, you may be obliged to forego an off-set drain. Since granite sinks are typically completely flat-bottomed, water tends to pool, especially with off-set drains.